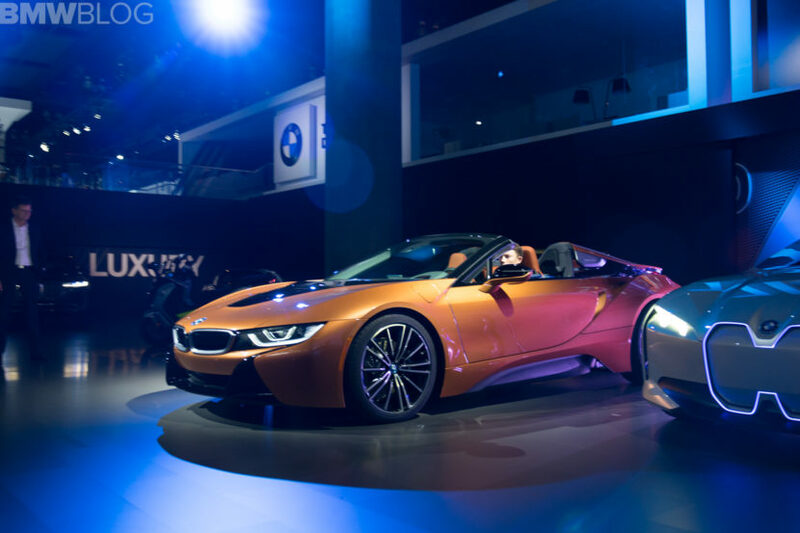 Starting in March 2018, the BMW i family gains a new member – the open-top i8 Roadster – and as expected, the new hybrid sportscar will be the most expensive BMW car sold in the United States. 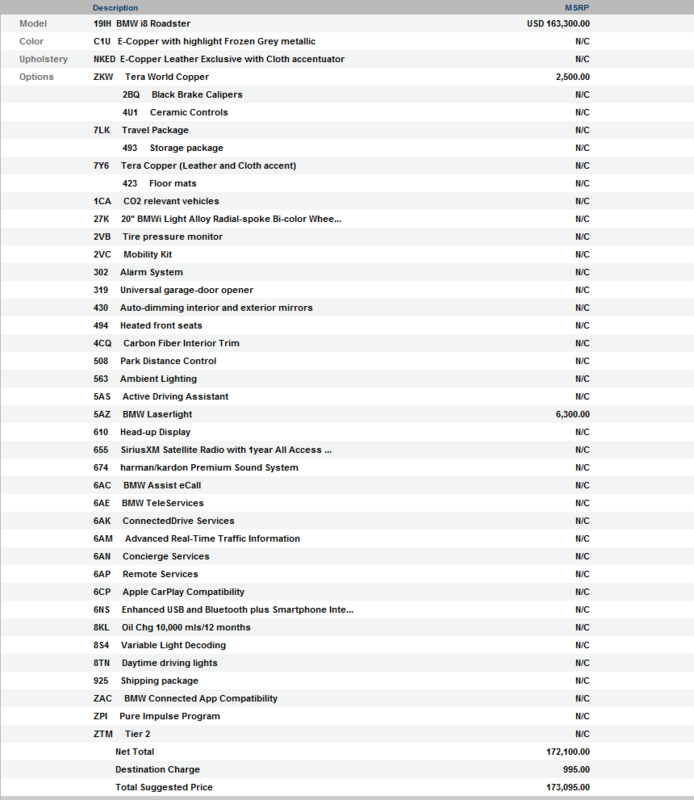 According to the pricing sheet, the 2018 BMW i8 Roadster has a base price of $163,300, plus the $995 Destination Charge. In the base price, BMW includes the E-Copper Leather, 20 inch bi-color wheels, Head-Up Display, heated front seats and the other usual BMW standard features. But if you’re in the mood for some special options, then BMW will sell you the Laser Lights for $6,300 and the Black Brake Calipers and Ceramic Controls for another $2,500. Special colors are also extra, such as the Crystal White Pearl Metallic with Frozen Grey or Frozen Blue accent for $1,800. The standard colors are E-Copper, Sophisto Grey Metallic and Donington Grey. A nicely equipped and unique 2018 BMW i8 Roadster will set you back at least $175,000. 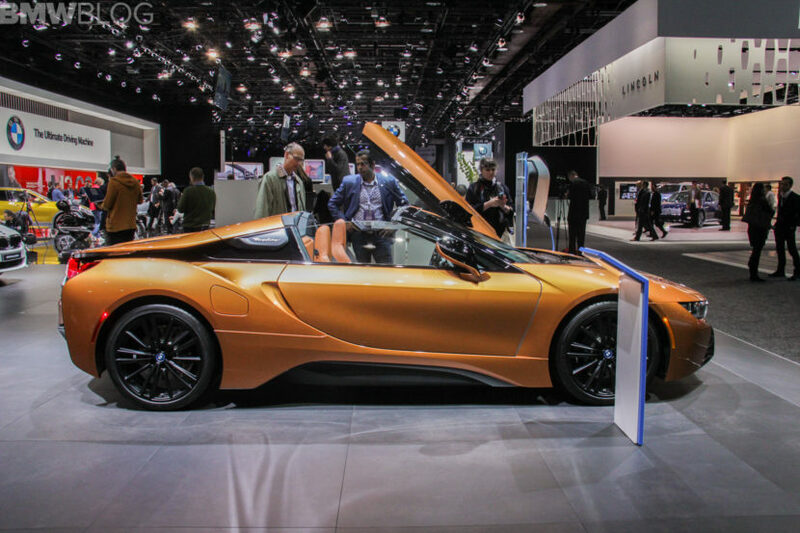 The BMW i8 Roadster uses the familia 1.5 liter turbocharged three-cylinder engine, so it still makes 228 hp and 236 lb-ft and is mated to an electric motor and six-speed automatic gearbox, powering the rear wheels. While an electric motor powers the front wheels, thus giving it real-time torque-vectoring all-wheel drive. 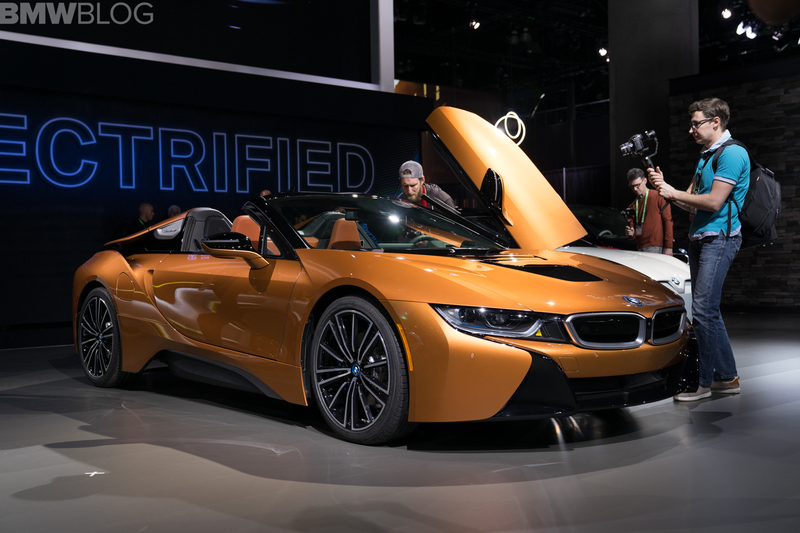 The latter motor makes 141 hp and 184 lb-ft of torque, up only slightly from the non-LCI BMW i8. So 0-60 mph happens in about the same 4.2 seconds. BMW claims there’s no performance penalty with the Roadster. Replacing the fixed hardtop roof of the BMW i8 Coupe is an electrically-operated soft-top roof on the i8 Roadster. The heavily soundproofed, all-season soft-top roof can open and close in less than 16 seconds, which is actually quite quick. It can also operate on the move, up to 31 mph, so getting caught in the rain won’t be so bad. The ordering system is now available for the i8 Roadster, so if you fancy a quite fancy car this summer (pun intended), then head over to your local dealership.